Wolfgang Amadeus Mozart. Very Good. In very good packaging. 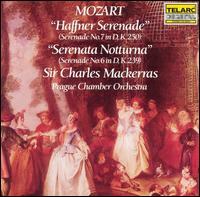 Mozart: Haffner Serenade. Very good in good packaging. Originally released: 1988. GUARANTEED: Your satisfaction is assured with Lightning Books. Fair. Ex-Library rental. Disc(s) are professionally cleaned and may contain only light scratches that do not effect functionality. Includes disc(s), case, and back artwork. Front booklet may be missing. Disc(s), case, and back artwork may contain library/security stickers and ink writing. Case and artwork may show some wear. ARTWORK MAY BE UNORIGINAL AND PRINTED BY LIBRARY. Case may not be an original jewel case. All disc(s) are authentic.